Accepta 2094 is a high performance; phosphate based scale and corrosion inhibitor water treatment product scientifically formulated for the treatment and protection of once through cooling water and reverse osmosis systems. 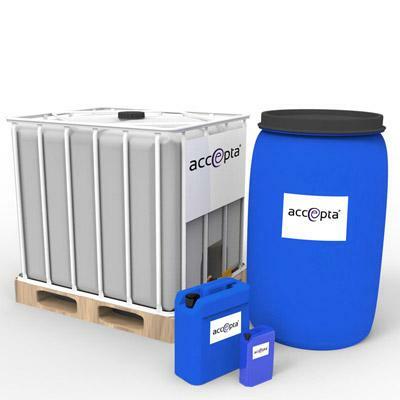 Accepta 2094 comprises an innovative blend of polyphosphates for use as a corrosion inhibitor, scale prevention, and iron and manganese stabiliser in industrial once-through cooling water systems and reverse osmosis systems. This technically advanced formulation is also designed for use in thermal treatment applications including pasteurisers and steriliser systems in the cooling section. A highly versatile product, Accepta 2094 can be used in both domestic and potable water systems up to 75°C to efficiently prevent scaling and corrosion even in hard waters. Accepta 2094 offers superior results, keeping surfaces clean to maximize heat transfer and extend the life of pipework and equipment, keeping maintenance costs to a minimum. Accepta 2094 is acceptable in the US (EPA, NSF) to treat potable water up to 38-ppm maximum product dosage. There are also approvals from European countries for potable applications available. The specific dosage of Accepta 2094 will vary depending upon the operating characteristics of your system, the water chemistry, and the severity of problems encountered. In potable applications the dosage should not exceed 25 ppm. Accepta 2094 should be fed neat directly from the drum preferably volume proportioned controlled by water meter. Dilution of neat product is not recommended. Do not close storage tank tightly as product is slightly gassing. Storage tank and feed system should be heated to prevent freezing of product when temperature falls below 2°C. Storage and application equipment (pumps, lines) should be made of stainless steel or plastic material, like PE, PP, PVC or Fibreglass.